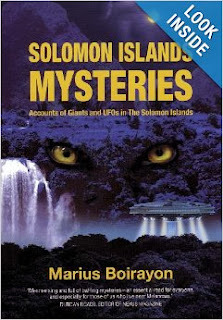 Joseph Jeppe, the chief of the Chapuru village in Guadalcanal, Solomon Islands, talks about his ancestors, cannibalism, giants, strange lights/UFOs, Kakamora ("small people" from Makira and Guadalcanal) and other mysteries. Contains also interview with Warren Aston. UFO news. Recent sightings over California! Did you see these lights? If so what do you think they were? Your comments appreciated. On New Year's Eve, many people across the state of California witnessed strange lights and craft in the sky. Witnesses in Auburn, California saw a large egg-shaped object with a bright light slowly cruising across the sky before suddenly accelerating at a high rate of speed. Others witnesses in the Sacramento area saw bright lights in a triangular formation. The same "orb triangle" UFOs were also witnessed in Los Angeles the very same night. Filmers comments: My daughter and her friend were walking about 10 p.m. and called me frantically telling me to come outside to see the lights in the sky. By the time I got there they were gone. She managed to video tape a small part of the event but stopped because she didnt feel she was getting anything. Here is a synopsis of the event in her words: "There were three large balls of light that hovered in the sky. One was very slowly hovering up and down, above and below the treetops in the distance. The others remained stationary for a while until the leftmost one sluggishly moved off to the left, away from the rest. A little bit after that happened, another one slowly showed itself to the right of the two that remained. In the video, I saw twinkling that I did not see with the naked eye." In the video her father and I downloaded from her LG motion cell phone, we saw some interesting artifacts not visible to her or her friend at the time. Although the video is short, there are a lot of curious bits in it notably to the left of the first light. The objects have a strange shape to them and do not appear to be lighted, but seen from light the balls cast. Please let us know if anyone else saw these or what you think they may be. It was enough of an event to alarm the girls, who walk outside at night a lot, and was definitely not the usual aircraft we see flying into Hartsfield Jackson. These lights, according to my daughter, were extremely bigger than aircraft lights we see on our nightly walks. I am including a copy of the video. It is not retouched or faked and is straight off of her cell phone. Filmers comments: I was driving home on 30/12 and saw these three bright orange lights in the sky. I pulled over and got on the hood of my car to get a better view. They seemed to move horizontally as well as disappear and reappear in different locations. Does anyone know what these lights were? They were bright orange but unfortunately my phone shows them as being lighter in color. A RealUfos reader sent in this video. Although the new year is a definite part of lantern season, this object does seem to move quickly. If anyone has also seen UFOs in Texas recently, please reply to this post. A worker in the small US town of Andover in Massachusetts, captured four mysterious lights on tape, in the night sky on December 19. Please note if you also saw this large meteor please reply to this post with details of your sighting.